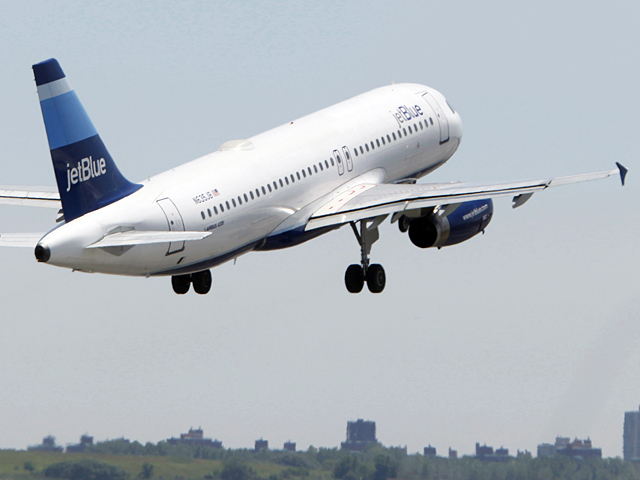 NEW YORK — Passengers on a JetBlue plane were stranded on the tarmac in Connecticut for more than seven hours Saturday. A passenger on a plane diverted to Bradley International Airport says they had no food, water or working bathrooms for the last few hours of the ordeal. A JetBlue spokeswoman confirmed that six of its planes were diverted to the airport as a result of storms in New York and New Jersey. But she declined to say how long the planes sat on the tarmac. A representative for Bradley International was not available to comment on whether other airlines experienced similar delays. JetBlue of New York also made headlines in 2007 when snow and ice storms stranded its planes for nearly 11 hours at New York's John F. Kennedy International Airport. Some people dream of a white Christmas; apparently Mother Nature was dreaming of a white Halloween this weekend. Winter reared its ugly head earlier than usual yesterday, causing a major crease in air travel. During the storm, multiple instrument failures occurred at JFK and Newark, affecting all carriers. This equipment is needed for flights to land when visibility is low; while it was out of service, both airports stopped accepting arrivals and eventually, a number of flights had to divert elsewhere to get more fuel. Six of our flights diverted to Hartford. We worked with the airport to secure services, but our flights were six of the 23 reported diversions into Hartford, including international flights (picture big jets carrying hundreds of people). Getting all the flights deplaned at the same time in a small airport is not unlike trying to get an elephant into a smart car; it's not an easy fit. As if things weren't challenging enough, the airport experienced intermittent power outages, which made refueling and jetbridge deplaning difficult (not to mention the roads there were bad, which put a wrench in getting buses to the airport to alternatively get everyone where they needed to go). Temporary loss of de-icing capability added yet another challenge to being able to get planes out in Hartford. Diversions in general, especially weather-related, are something that we plan for regularly. If heavy winds or a blizard are coming in, we look at our major cities and secondary cities in advance, sending the area's airports a list 24-48 hours out asking what their capabilities are for handling diversions. We look at things like: does the airport have TSA on hand, buses, staffing, customs agents, etc. so we have it ahead of time. Flights are planned with alternates in mind and fueled accordingly. Most diversions during weather are what we call "fuel and go" events. They happen specifically so we can get enough gas to navigate around the weather that's built up in a certain area. Sometimes, the diversion is simply to wait out the storm. In the case of Hartford, unfortunately, a power outage and failure of back up power resulted in the fuel supply being disrupted and the fueling of all airline diversions was halted. The capability to refuel aircraft was restored later, after which we planned our four extra sections for today (3 to JFK, 1 to EWR) and approximately 500 of the roughly 700 customers who were diverted there are booked on them today. A special thank you goes out to John, our General Manager Hartford and his team for working through the night and into today to recover the operation there. Another thank you goes out to JFK who sent additional crewmembers and leadership to Hartford to assist in preparing our aircraft and processing customers for today's extra flights. And a big thank you goes out to our customers for their patience during this weekend's challenges. We apologize to those impacted by this confluence of events, as it remains our responsibly to not simply provide safe and secure travel, but a comfortable experience as well. We're offering customers traveling to/from the New York area today fee waivers to change or cancel their flights. Check jetblue.com for the full details and be sure to check the status of your flight before heading to the airport.